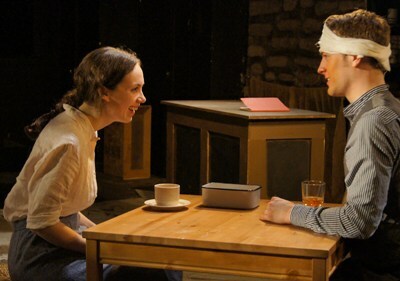 Interview: As playwright Martin McDonagh’s spunky Helen, the young Boston-bred actor summons a character that amazes (or annoys) audiences at Redtwist Theatre. Through July 1. The “cripple” in McDonagh’s tale about the bleak, rough life on the isle of Inishmaan off the west coast of Ireland, in the 1930s, is a lad called Billy, who grabs at life’s brass ring by sailing off to America with dreams of stardom in Hollywood. But the character likely to stick most vividly in memory is Helen, a lass brimming with life who gets along on her good looks and a policy of intimidation. Not for a moment does Buzan’s intense, free-wheeling – indeed, free-swinging – Helen bring to mind sweet mitigation. This girl, who says she’s been fending off the paws of lascivious priests since she was six years old, meets the world head-on. No one, man or woman, old or young, messes with Helen. For Bouzan — who grew up near Boston and gravitated to the Chicago theater scene after graduating from Vassar College in 2010 — embracing the rockier side of the Irish character also meant grappling with an Irish accent for the first time. No doubt Helen’s most remarkable diversion is smashing eggs over the head of her hapless brother Bartley. Real eggs, mind you, that ooze over the hair and down the face and clothing of actor Patrick C. Whalen. Still, the actor admits she wasn’t so blasé about capping her colleague with eggs at the start. That took some adjustment and, she adds, reduced director Kimberly Senior to a puddle of convulsive laughter. 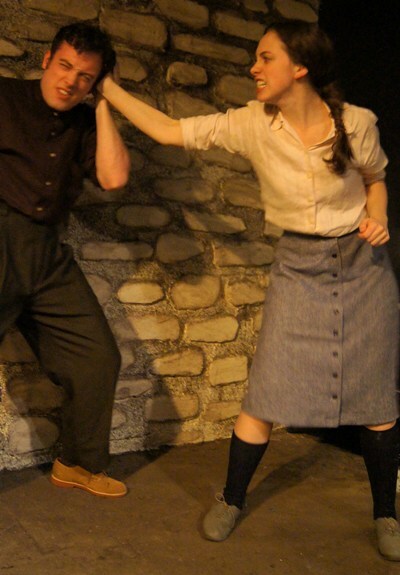 Helen’s two-fisted aggressiveness notwithstanding, says Buzan, underneath it all she’s a teenager like any other, vulnerable and sweet on Cripple Billy (Josh Salt). Helen doesn’t exactly throw herself at Billy. It’s not her style, says Buzan. She may have put her shield aside, but not her rapier. Billy will still feel the edge of that. The Redtwist production is not Buzan’s first encounter with McDonagh’s denizens of Inishmaan. While she was still in college, she and a group of fellow acting students read through the play. “We thought it was just a lot of silly people saying silly things,” she recalls. 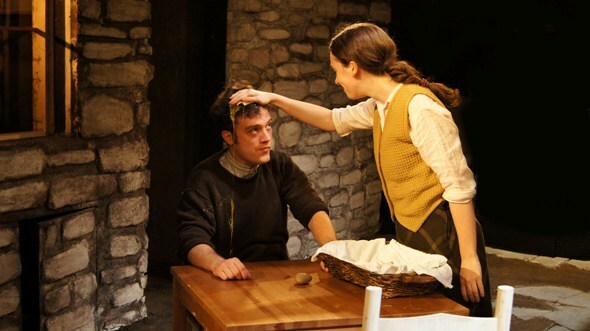 Now, immersed in the ruggedly humorous culture of Inishmaan, she sees the picture quite differently. Her voice trails off with a sigh, like the viscous drip of a raw egg. Wonderful to hear we have a talented actor in the family. I will be looking forward to following her career from now on. All the best to you Baize.